"Silhouette." 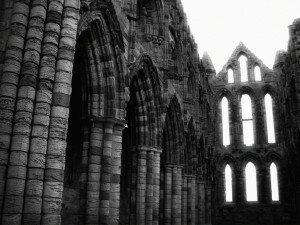 The Abbey Ruins at Whitby, Yorkshire, England. By Rick Morley. A reflection on Matthew 13:31-33, 44-52, the Gospel Lesson from the Revised Common Lectionary for July 24, 2011. I also have a reflection on the Old Testament lesson for the week. “What’s a tsumami?,” my seven year-old daughter Zoe asked. She had just walked into the family TV room and caught a glimpse of the morning news of Japan’s horrific earthquake before I could change the channel. She had asked what had happened, and we decided we’d be as truthful as we could. After explaining how far away Japan was, and that Basking Ridge wouldn’t probably have any tsunami’s, we then had to try and explain the physics of a tsunami to her. After stammering through a few sentences on tectonic plates, it was clear I wasn’t getting anywhere. When concepts are so big and broad that we have a hard time understanding, it’s helpful to be given a metaphor. It’s helpful to bring it down in size and scope and for it to be put in a scale that we can wrap our head around. In the thirteenth chapter of the Gospel of Matthew Jesus finds himself with the need to explain the Kingdom of God to a bunch of mere mortals. Were he to say what the Kingdom is like in actual terms, and in actual size and scale, it’d be like explaining a catastrophic natural event in scientific terms to a kid in elementary school. We’d just stare at Jesus with eyes wide open, and have no idea what he was talking about. So Jesus tells them (and us) that in one sense the Kingdom is seemingly small, but holds immensity, like a mustard seed or a pinch of yeast. The Kingdom is also something that has immense worth, like a pearl or a treasure. The Kingdom is also like a net that catches all, but needs separated out. And, it’s like a master who clears out his closets and desk drawers. To be clear, the Kingdom isn’t a seed, or a pinch of yeast, or a pearl, a treasure, a net, or a master. Each of those things capture one little glimmer of the Kingdom, and brings it down to a size and scale that we can understand. Like kicking legs in a bathtub, or a well executed cannonball. St. Paul, in the thirteenth chapter of his First Letter to the Corinthians tells us that when it comes to understanding our faith, we see through a dim mirror. Mirrors in his days were of polished metal, or stone. Hardly the crisp clear mirrors we’re used to picking up in the drug store for 99 cents on clearance. Imagine a dim bronze mirror. Not even your good quality bronze mirror, with a high sheen. That’s what we get: a reflection, and a poor one at that. Jesus’ parables, the words of St. Paul, and much of the Bible should serve as a reminder that when it comes to the enormity of God, God’s Kingdom, God’s Salvation, etc. we are not only merely privy to dim reflection—silhouettes—but a silhouette is all we can handle. Until, of course, that day when the dim mirror is exchanged—and the seed-like, yeast-like, net-like, master-like, treasure-like, pearl-like, shepherd-like, lamb-like, bread-like, rock-like, strong-tower-like, potter-like nature of God is laid out in all it’s splendor and majesty for us all to behold. Then it’ll be time to sing, and feast. But, until that day, we’re just kids kicking around in the tub, washed and washed and washed by our Father. Or, kind of like that. What are the implications of Jesus teaching in parables for how we should preach and teach the faith? Do we emulate the giving of metaphor, or do we simply break the metaphors down?